Eating prunes as part of a weight control diet may improve weight loss, according to new research from the University of Liverpool in the UK. Consumption of dried fruit is not readily recommended during weight loss despite evidence it enhances feelings of fullness. However, the research, which was recently presented at the European Congress on Obesity in Sofia, Bulgaria, showed that participants who ate prunes experienced greater weight loss. The study was undertaken by the University of Liverpool’s Institute of Psychology, Health and Society. 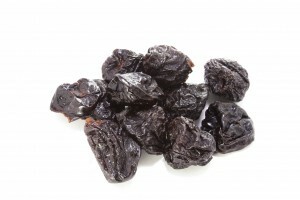 The study of 100 overweight and obese low fibre consumers tested whether eating prunes as part of a weight loss diet helped or hindered weight control over a 12-week period. It also examined if low fibre consumers could tolerate eating substantial numbers of prunes in their diet, and if eating prunes had a beneficial effect on appetite. To assess the effects of prunes on weight and appetite, participants in the study were divided into two groups – those who ate prunes every day (140g a day for women and 171g a day for men) and those who were given advice on healthy snacks over the period of active weight loss. The researchers found that members of the group which ate prunes as part of a healthy life-style diet lost 2kg in weight and shed 2.5cm off their waists. However, the people in the group which was given advice on healthy snacks lost only 1.5kg in weight and 1.7cm from their waists. The study also found that the prune eaters experienced greater weight loss during the last four weeks of the study. After week eight, participants showed increased feelings of fullness in the prune group. Moreover, despite the high daily doses, prunes were well tolerated. “These are the first data to demonstrate both weight loss and no negative side effects when consuming prunes as part of a weight management diet,” said Dr Jo Harrold, a Liverpool psychologist who led the research. “Indeed in the long term they may be beneficial to dieters by tackling hunger and satisfying appetite; a major challenge when you are trying to maintain weight loss,” she said. “Maintaining a healthy diet is challenging. Along with fresh fruit and vegetables, dried fruit can provide a useful and convenient addition to the diet, especially as controlling appetite during dieting can be tough,” said Professor Jason Halford, Professor of Experimental Psychology and Director of the University of Liverpool’s Human Ingestive Behaviour Laboratory. Aldi has announced that from second quarter 2017 it will begin on-line retail operations in China.